It’s the single item of clothing that defines us as Trekkies! Distinguishable from a mile away and dripping with iconography, the Starfleet Uniform is a solid staple of pop culture. Go to any comic book convention and you are sure to spot your fellow lovers of Trek clad in their finest away team gear. It’s the one item of clothing that should be in every fans wardrobe. Right off the bat, I despise these uniforms. They are one of many elements why I’m not a fan of Season 1 of TNG (including the stilted acting, cheapo music and overuse of certain Wesley Crusher as a “deus ex machina”). The uniforms are the space faring equivalent of a morphsuit; they’re just awful in every respect. You could see in some of the early episodes they were trying to evoke the Original Series with Troi’s “Cosmic Cheerleader” uniform. 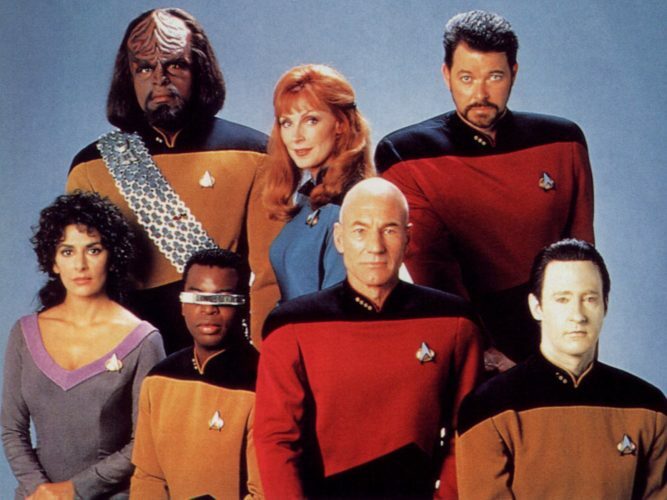 But the TNG unisex scant on men? “Shudder” The less said about this the better. Even Patrick Stewarts back hated them and according to the cast the spandex stank with BO under hot studio lights. Whilst they did establish the TNG era ranking system I was glad to see them evolve into something more sensible in the coming seasons. 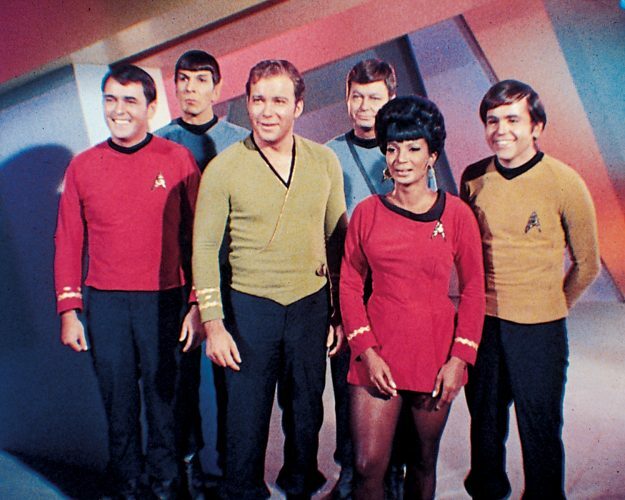 Bland, beige and very 70’s, these uniforms only had one outing in the Trek universe. With confusing colour codes and a seemingly endless level of customisation left eagle eyed Trek fans wondering “who the heck does what” and “why does Spock get to wear a turtle neck” and “McCoy a disco style V-Neck?” Whilst I personally have a soft spot for them (they remind me of the ones on Space 1999) I know most fans don’t consider them a classic so much so I saw only ONE TMP era uniform at Destination Star Trek 2012. 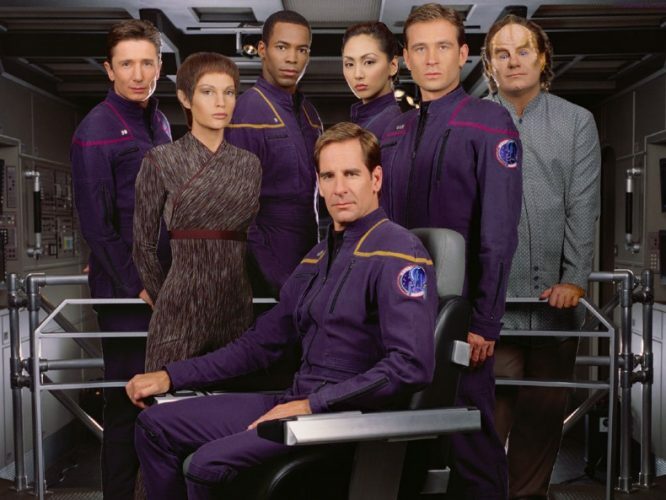 That said some of the elements of the TMP uniforms carried over into the dress uniform styles in the 2009 reboots. Kirks Admirals uniform does look quite dashing. Archer and Co were bedecked with uniforms that were more akin to the 21st century with their NASA like flight suits and mission patches. Only problem was that the navy blue overalls just blended in with the hull making everything look dull, much like most of the series. Bonus points are given for the cool bomber jackets and baseball hats. Made the show feel more relatable but somehow less connected to the Trek universe we all know and love. 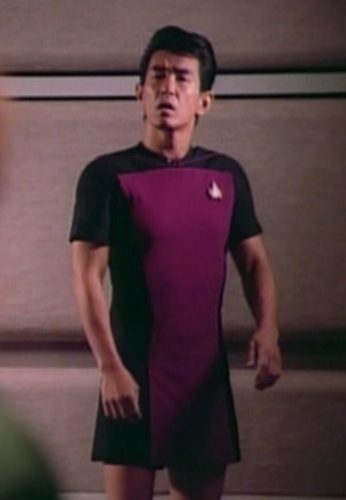 These Starfleet uniforms were created to deliver a more distinctive look between TNG and the new overlapping series DS9. 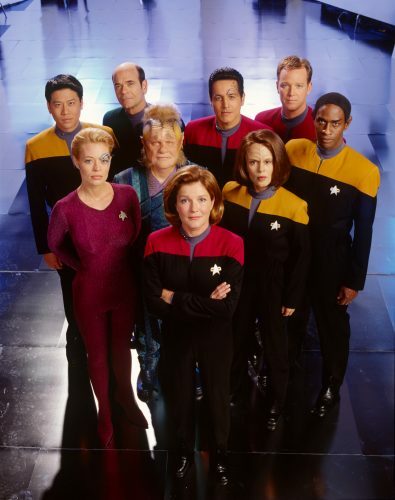 Whilst it enjoyed extended on screen time with the stranded crew of Voyager it was its use as the primary or secondary uniform of Starfleet that puzzles me. Sisko swapped between his DS9/VOY uniform to a TNG uniform whilst visiting Earth whilst it seems that not all the crew got the memo on the Enterprise D in Star Trek Generations that the uniforms were being modified. The behind the scenes explanation was that they were going to replace the TNG uniforms with new ones but I’m a sticker for continuity. A definite fan favourite all the same. Darker, edgier and more reflective of the more war torn Star Trek tales of late these new uniforms are more believable in that they swap out that questionable mauve turtle neck with the division colours. 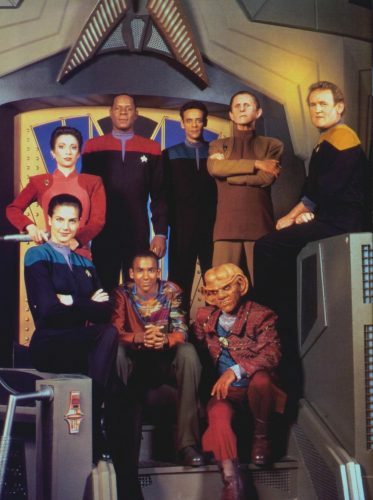 A more sober take on the DS9/Voyager era uniform these were designed to look good on the big screen. A solid effort. TNG got better when Riker grew his beard. It also got better when they changed the uniform. The turnaround in uniform design had to be brought about due to complaints from Patrick Stewart that the tight spandex from the previous uniform was misshaping his spine. The marked differences were the inclusion of the mandarin collar and the officers variant becoming a two piece top which had to be tugged down now and again (aka the Picard Manoeuvre). 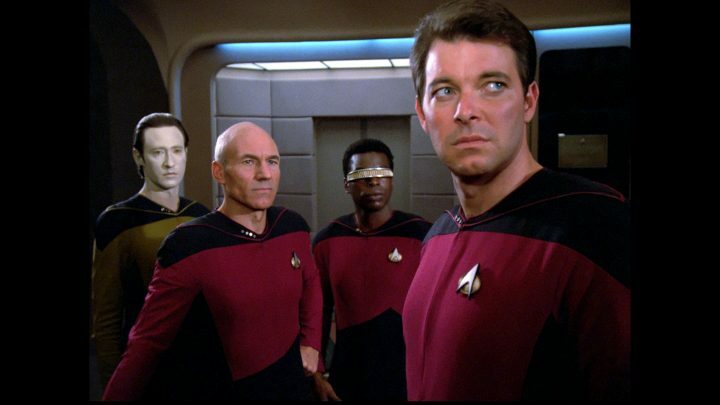 TNG’s best moments from The Best of Both Worlds, Yesterdays Enterprise (which has a slight modification) and Chain of Command would all feature our heroes in these outfits and long will they remain in Trek fans hearts and minds. Iconic is a term that’s overused. 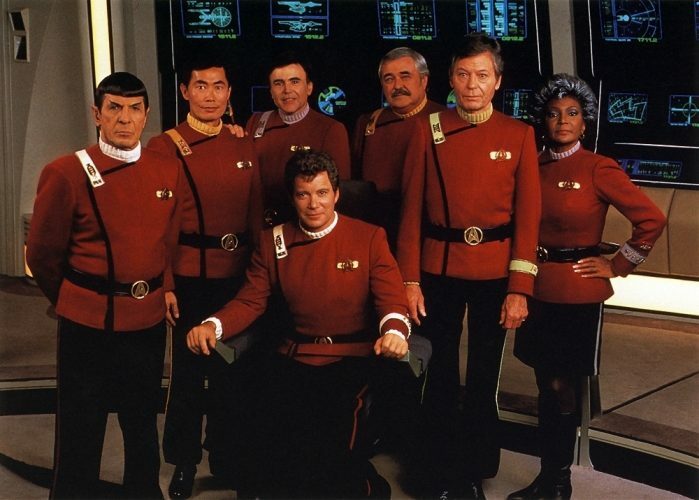 But then again it most certainly applies to the uniforms of the Original Series. Designed by William Wear Theiss these Pop culture classics were simple, bright and instantly recognisable. The sight of Kirk, Spock and co in these uniforms are nothing sort of legendary. The mini skirts on the female members of the crew, so evocative of the 1960’s era, are remarkably risqué given the rigid censorship of the time. And it was of course this uniform that gave rise to the term “redshirt” for the unfortunately disposable members of the Enterprise. Interesting fun fact. Kirks famous command gold shirt is in fact chartreuse green! The colourisation of the film and the lighting only makes it look gold on the screen. The 2009 reboot did well not to tamper too much with the old uniforms, keeping the overall style and look of the originals whilst the latest from Star Trek Beyond added a mandarin collar and had a fetching survival jacket for away missions. But if this renowned uniform has only came in at number 2 what pips it to the post? The Monster Maroons. A design so popular even Zap Brannigan copied elements from it. But boy do they look great! 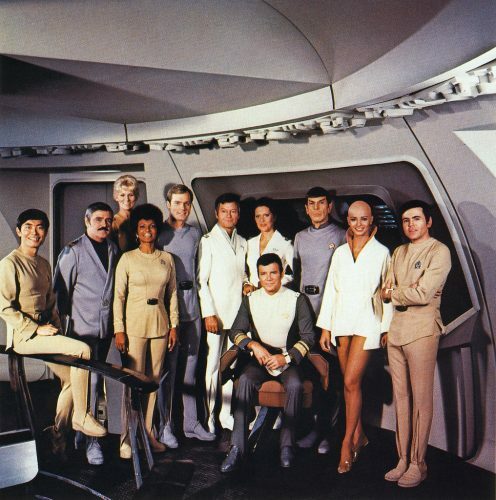 Keen to move away from the unpopular TMP style uniforms (which the actors found it hard to go to the bathroom during long shoots) costume designer Robert Fletcher wanted a more regal, naval like dress uniform. A holy grail of a costume for all Trek fans; decent replicas are hard to come by and quite pricy. But style fatigues will remain indelibly linked with some of Trek’s finest on screen moments in particular the Enterprises face off with Kahn, Spocks tragic death and their poignant send off at the end of The Undiscovered Country. Agree or disagree?!? Let us know what you think. Remember it’s just a bit of fun.